Back to Basics: About Ultrafiltration (UF) By Gil Dhawan | Applied Membranes Inc.
By G.K. Dhawan, President of Applied Membranes, Inc. When a membrane is used for a separation, the concentration of any species being removed is higher near the membrane surface than it is in the bulk of the stream. This condition is known as concentration polarization and exists in all ultrafiltration and reverse osmosis separations. The result of concentration polarization is the formation of a boundary layer of substantially high concentration of substances being removed by the membrane. The thickness of the layer and its concentration depend on the mass of transfer conditions that exist in the membrane system. Membrane flux and feed flow velocity are both important in controlling the thickness and the concentration in the boundary layer. The boundary layer impedes the flow of water through the membrane and the high concentration of species in the boundary layer produces a permeate of inferior quality in ultrafiltration applications relatively high fluid velocities are maintained along the membrane surface to reduce the concentration polarization effect. Ultrafiltration Membrane modules come in plate-and-frame, spiral-wound, and tubular configurations. All configurations have been used successfully in different process applications. Each configuration is especially suited for some specific applications and there are many applications where more than one configuration is appropriate. For high purity water, spiral-wound and capillary configurations are generally used. The configuration selected depends on the type and concentration of colloidal material or emulsion. For more concentrated solutions, more open configurations like plate-and-frame and tubular are used. In all configurations the optimum system design must take into consideration the flow velocity, pressure drop, power consumption, membrane fouling and module cost. A variety of materials have been used for commercial ultrafiltration membranes, but polysulfone and cellulose acetate are the most common. Recently thin-film composite ultrafiltration membranes have been marketed. For high purity water applications the membrane module materials must be compatible with chemicals such as hydrogen peroxide used in sanitizing the membranes on a periodic basis. Pore sizes for ultrafiltration membranes range between 0.001 and 0.1 micron. However, it is more customary to categorize membranes by molecular-weight cutoff. For instance, a membrane that removes dissolved solids with molecular weights of 10,000 and higher has a molecular weight cutoff of 10,000. Obviously, different membranes even with the same molecular-weight cutoff, will have different pore size distribution. In other words, different membranes may remove species of different molecular weights to different degrees. Nevertheless, molecular-weight cutoff serves as a useful guide when selecting a membrane for a particular application. There are several factors that can affect the performance of an ultrafiltration system. A brief discussion of these is given here. FLOW ACROSS THE MEMBRANE SURFACE The permeate rate increases with the flow velocity of the liquid across the membrane surface. Flow velocity if especially critical for liquids containing emulsions or suspensions. Higher flow also means higher energy consumption and larger pumps. Increasing the flow velocity also reduces the fouling of the membrane surface. Generally, an optimum flow velocity is arrived at by a compromise between the pump horsepower and increase in permeate rate. Permeate rate is directly proportional to the applied pressure across the membrane surface. However, due to increased fouling and compaction, the operating pressures rarely exceed 100 psig and are generally around 50 psig. In some of the capillary-type ultrafiltration membrane modules the operating pressures are even lower due to the physical strength limitation imposed by the membrane module. 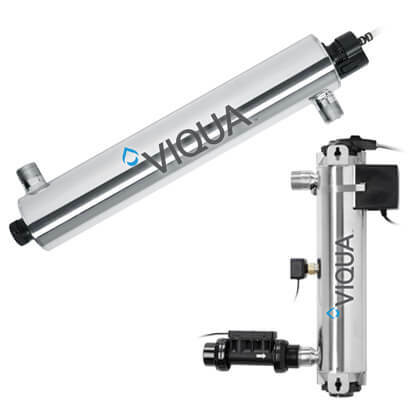 In high purity water systems, ultrafiltration is slowly replacing the traditional 0.2-micron cartridge filters. In Japan, practically all of the semiconductor industry follows this practice. An ultrafiltration membrane with a molecular-weight cutoff of 10,000 has a nominal pore size of 0.003 micron. When an ultrafiltration membrane is used instead of a 0.2-micron cartridge filter, particle removal efficiency is greatly improved. In addition, ultrafiltration membranes are not susceptible to the problem of bacteria growing through them, as is the case with 0.2-micron filters. In a recent study (1), the performance of an ultrafilter was compared with that of a 0.2-micron cartridge filter. Some of these results are given in Table A. The Ultrafilter used in the study had a molecular-weight cutoff of 100,000- (pore size 0.006 micron). As the requirements for the quality of high purity water become more stringent, we can expect to see an increasing use of ultrafiltration as a final filter. Ultrafiltration system operation and maintenance is similar to that of reverse osmosis systems. Daily records of feed and permeate flow, feed pressure and temperature, and pressure drop across the system should be kept. Membranes should be cleaned when the system permeate rate drops by 10% or more. Feed flow is critical to the operation of ultrafiltration systems. A drop in feed flow may be due to a problem in the prefilter (if any), with the flow control valve, or with the pump itself. When the system is shut down for more than two days, a bacteriocide should be circulated through the membranes. At restart, permeate should be diverted to drain until all the bacteriocide is removed. 1 Gaudet, P.W. "Point-of-use Ultrafiltration of Deionized Water and Effects of Microelectronics Device Quality, American Society for Testing and Materials", 1984. Feed - Liquid to be treated by the ultrafiltration system. Permeate - Liquid stream that passes through the membrane. Recovery - Expressed as percentage, this defines the permeate rate as a fraction of the feed rate. Recovery provides an immediate measure of the maximum concentrations in the system and it affects permeate quality, pump size, power consumption and membrane fouling. Rejection - Percent removal of a particular species by the membrane. Expressed as 1-CP CF where CP is the concentration in the permeate, and CF is the concentration in the feed. Flow Velocity - Rate at which the liquid goes along the membrane surface, expresse d in length per unit time (ft/sec).